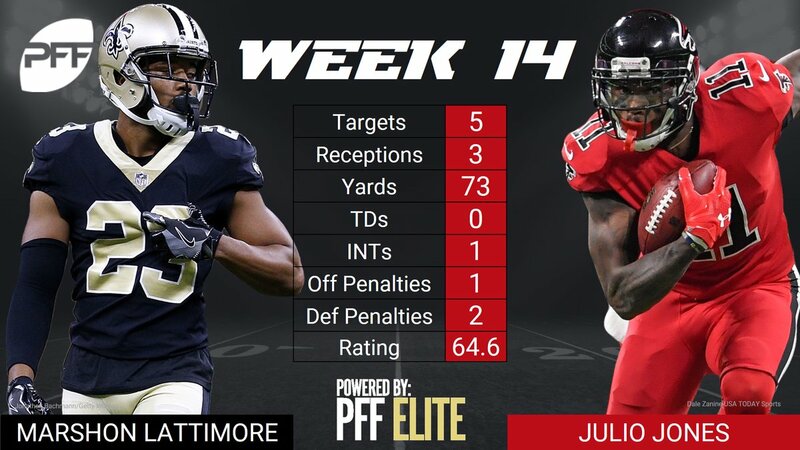 WR Julio Jones vs. CB Marshon Lattimore – In the first matchup between these two teams back in Week 13, Jones and Lattimore went to battle in high-profiled matchup. This time around will be another big time matchup as both players have received Pro Bowl invites this past week. Jones has put together another fantastic season as he ranks second among wide receivers in overall grade with a grade of 90.7. Lattimore has also put together an impressive campaign as he ranks second in wide receiver rating allowed by surrendering a rating of just 37.5. RB Devonta Freeman vs. LB Craig Robertson – Freeman took on a larger role last week due to fellow running back Tevin Coleman missing the game with a concussion. Freeman produced his highest yardage output on the season and has continued to be one of the most elusive backs this season. The Falcons’ leading rusher has earned an elusive rating of 54.4, which ranks tenth among running backs. The Saints will turn to Robertson to try to slow Freeman down. Robertson has been a key cog for the Saints defense, as he has played the second-most snaps among Saints linebackers and has earned a run stop percentage of 8.7 percent. T Ryan Schraeder vs. Edge Cameron Jordan – Jordan is having one of the best seasons of his career and has been a problem for opposing offensive tackles. Heading into this week’s matchup, Jordan is tied for first in overall grade among edge defenders with an overall grade of 95.3. Jordan spends the majority of his snaps rushing against right tackles, meaning Schraeder, the Falcons right tackle will see plenty of Jordan this week. Schraeder has performed better as a pass-blocker this year, earning a pass-blocking efficiency rating of 97.0. RB Alvin Kamara vs. S Keanu Neal – Kamara continues to put together a season that’s on pace to be one of the most efficient in NFL history. Kamara’s 90.1 overall grade is the second-best among 58 qualifying running backs. His 128.9 elusive rating is the highest among qualifying running backs, and his incredible 2.69 yards per route run is No. 1 out of 53 running backs with at least 76 snaps in route. Neal with often be tasked with defending Kamara. His 5.0 run-stop percentage is tied for 20th among 83 qualifying safeties, but among 69 safeties with at least 155 snaps in the passing game, he’s got a below-average tackling efficiency number of 8.6 when defending receivers. WR Michael Thomas vs. CB Robert Alford – After earning an overall game grade of 92.7 against the Jets in Week 15, Thomas’ overall grade of 90.0 stands at third among 115 qualifying wide receivers, and he’s one of only three with an elite grade. He also finished the week without a drop, lowering his drop rate to 2.08, now the fourth-lowest out of 35 wide receivers with at least 79 targets. Thomas has spent 61 percent of his snaps aligned to the left, while Alford has spent 90 percent of his coverage snaps across from that side. His 75.4 overall grade is 58th out of 119 qualifying cornerbacks, and he’s allowed 1.16 yards per snap in coverage, 60th-most among 89 qualifying cornerbacks. 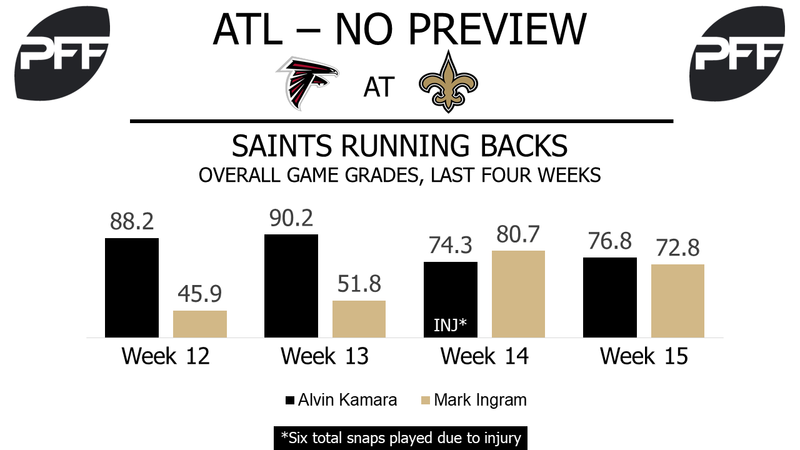 RB Mark Ingram vs. LB Deion Jones – While Kamara’s receiving well-deserved attention for his eye-popping numbers this season, Ingram’s performance has also been excellent. His 77.9 overall grade ranks 23rd among 58 qualifying running backs, and he’s contributed many explosive plays to the Saints’ offense. On the season, 40.0 percent of his rushing yardage has come from runs of 15-plus yards, and his 39.9 breakaway percentage is No. 1 among 22 running backs with at least 156 attempts. Jones was involved in tackling Ingram on seven of his 12 rushing attempts in Week 14 and figures to defend him regularly. Jones is the eighth-highest graded linebacker at 87.0. His 306 snaps defending the run are tied for the 21st-most out of 127 qualifying linebackers, and his 16.5 tackle efficiency against the run ranks him 47th among the same group of linebackers.